It’s harvest time for potatoes and we would like to pass along a few of the results from our trials here at Heritage Farm. With over 14 varieties grown this summer, it’s hard to pick a favorite, but so far it looks like an “unknown” purple handed down through generations is in the lead as a conversation piece, especially with kids. We had planted a few varieties in the raised beds this spring thinking we could encourage some early new baby potatoes to the dinner table sooner. 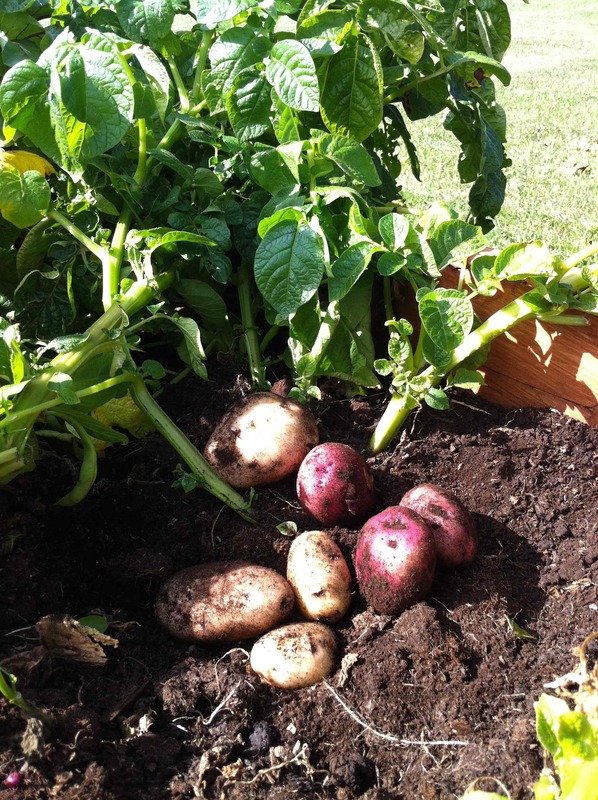 We were surprised to find that we could reach into the light soil under the plants by July 30 to steal 2” potatoes. Of course this would jeopardize the harvest weight results at the end of the season trial – but we had fresh potatoes all summer, so it’s all good! 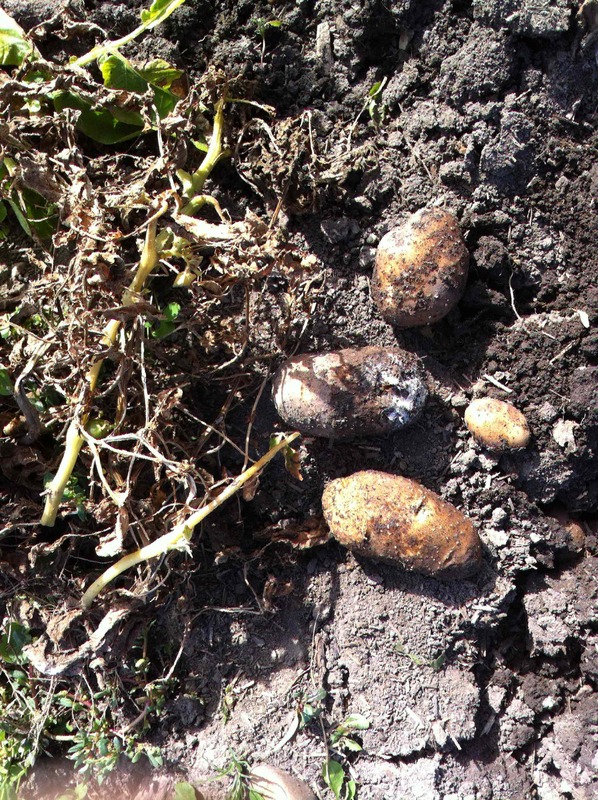 These stolen potatoes above were easily removed without damaging the main plant. By the third week in September we had decided to harvest a majority of the potatoes due to early frosts here in zone 2b. We were very impressed with the quality. Large, clean, no scabs and VERY easy to harvest. 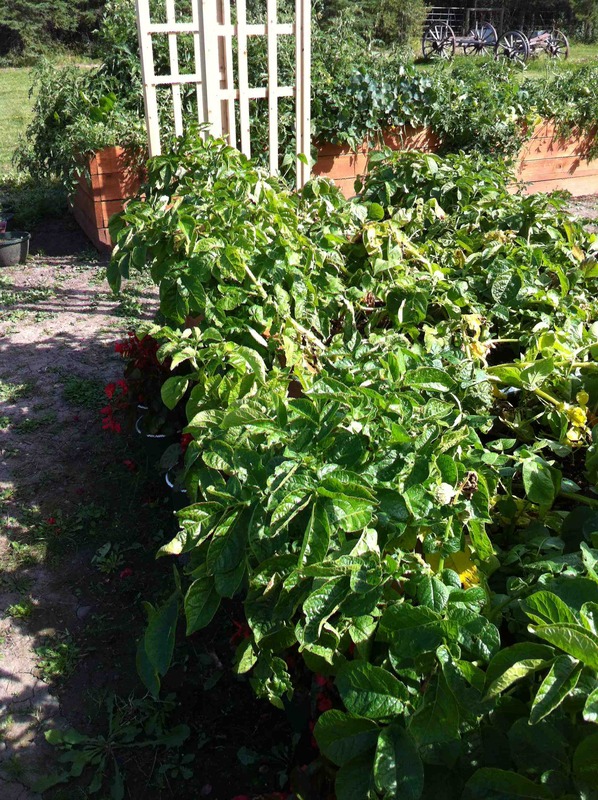 Despite stealing all summer, we harvested more usable potatoes from 12 plants in the raised bed than from 5 rows (over 250 hills) in the traditional garden plots. Which brings me to . . . In all fairness I will note that due to heavy rains early in the season, a majority of the plants were lost to rot and drowning. 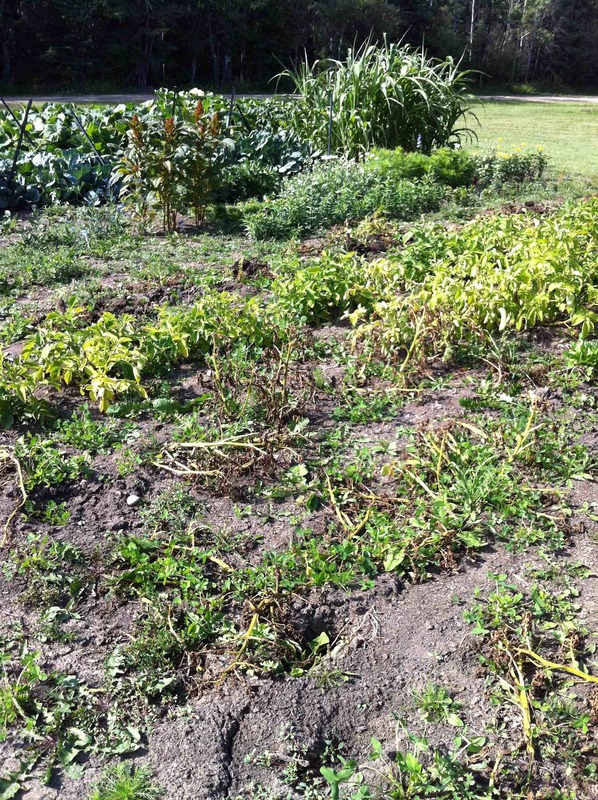 These potatoes above had developed from new growth later in the season as surviving plants were further stressed by an extended period of drought that followed the early heavy rains. The common scab that you encounter in your garden is a plant disease caused by a Streptomyces species which is less likely to cause problems in moderately acid soils (pH 5.5 – 6.0) vs. higher pH soils. Although the potatoes are still safe to eat as mashed or peeled, the quality makes them unsuitable for resale and quite frankly stresses all new gardeners. Any other established traditional garden would have produced much better results than we saw here on our 7 year old plot. This plot had been converted from pasture with many organic amendments added over the years. The heavy rains caused a crust on the compacted soil once we headed in to the drought. Due to the large size, it is still a long way from being the rich loamy gardens you may see on the old farmsteads or urban historic lots. 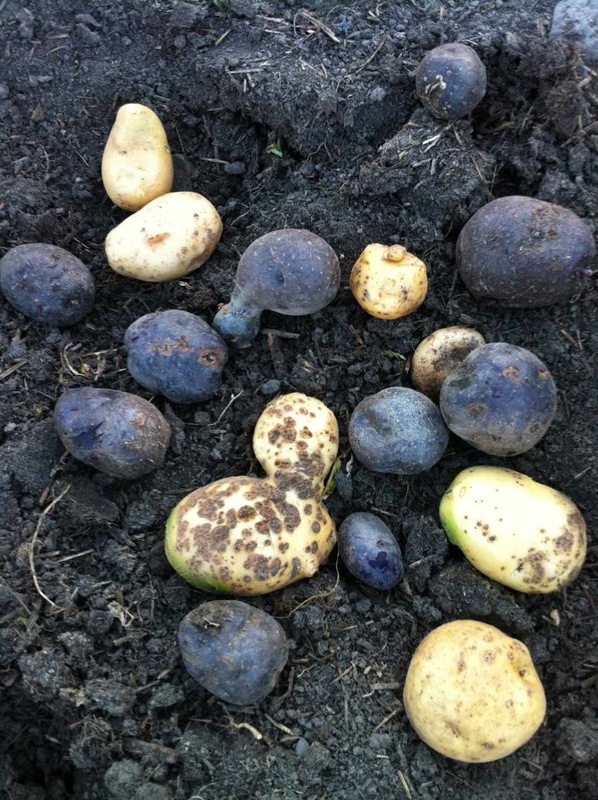 Same potatoes – wetter area in the ground plot. These ones didn’t stand a chance after the second 3 day downpour. Although this plot is on the top of a hill, the low-lying areas do not offer enough drainage because of the heavy clay soil. Although it is not likely that we will build the high raised beds for an entire field potato crop, we will be amending the soil even more with straw, peat and organic matter before banking up a series of lower raised beds this fall. By adding peat moss we can increase acidity to deter scab as well as improve aeration and drainage. Logistically, we may just bank the soil up 6” – 12“ with old logs or rough cut 2” x 6”.